Try this easy recipe to make your own high energy bird suet. Most birds will enjoy this suet including the early spring arrivals when it is still too cold for plenty of insects and worms. Nut pieces, seeds, dried fruit, apple you may have. I usually use sunflower seeds, raisins, left over nuts from Christmas baking, and 1 unpeeled chopped raw apple. You can even try chopped vegetables. Metal suet holder or any sack with holes, such as an onion bag. Combine all dry ingredients with fruit/nuts/seeds/apple. Melt lard and peanut butter in the microwave on low. Stir dry ingredient mix into melted lard/peanut butter mixture. Pour into 1 cup containers. Let it cool, then place it in the freezer. When solid, place in your suet container and hang in a tree or close to a window so you can watch the action. Squirrels love this suet! 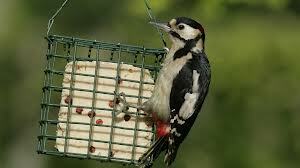 So hang on a long wire so they cannot reach it or use a baffle just above your suet. You can expect Downy, Hairy and Red Bellied Woodpeckers, Chickadee, Red Breasted and White Breasted Nuthatch, Carolina Wren, House Finch, Sparrow, Cardinals, Blue Jay and Robins.